The museum’s latest contemporary art exhibit is Haroon Mirza’s “The Night Journey” (2017-8), an immersive light and sound installation that is based on an early nineteenth-century Indian miniature painting in the museum’s collection, depicting the Night Journey of Muhammad. According to the Quran and other sources, in 620 or 621 CE, The Prophet, accompanied by the angel Gabriel, ascended from Mecca, while mounted on the winged, human-headed steed Buraq (meaning ‘riding beast’), to “the farthest mosque,” in Jerusalem, where he discoursed and prayed with his prophetic forebears. This journey is called the Isra. In a second phase of the journey, the Mi’raj, Muhammad ventured on, to heaven and hell, and to the Lotus of the Utmost Boundary, where he received a revelation about the rituals he should share with his followers in Mecca. This one-night journey, commencing with Muhammad’s awakening by Gabriel, has been interpreted both literally and symbolically—as a physical and spiritual quest. Visitors to “The Night Journey” find themselves in a small, darkened gallery outfitted with acoustic panels (which may suggest Islamic mosaic patterns to some). 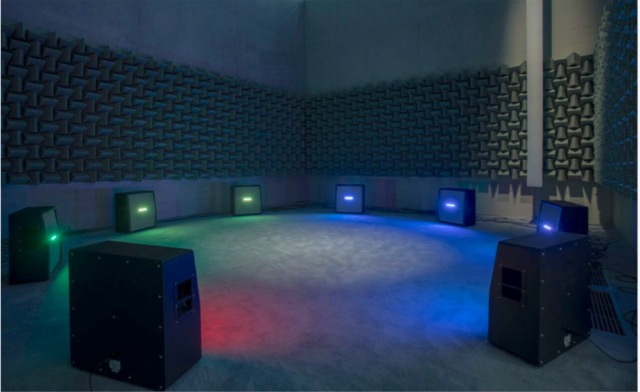 Around the room on the floor sits a Stonehenge-like circular array of vintage Marshall cabinet speakers, black and square, emitting buzzing, grinding and droning notes that invoke both electronic sampling and electrical discharges The speakers are outfitted with linear LED light displays, reminiscent of graphic equalizer displays, that switch on and off with the sound, and brighten with volume, casting dancing shadows on the gallery walls. 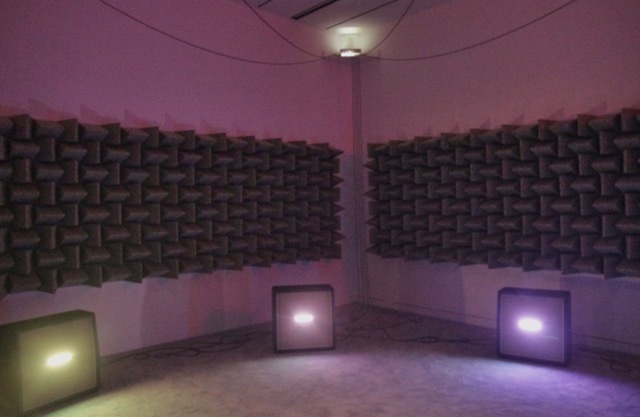 Both light and sound are controlled by a computer that is mounted high on the wall in a corner. Amid this almost nightclub-like techno-modernity, mystical journeys do not spring immediately to mind. The artist is interested less in the particulars of the Journey story and more with how psychic states derive from physical stimuli. 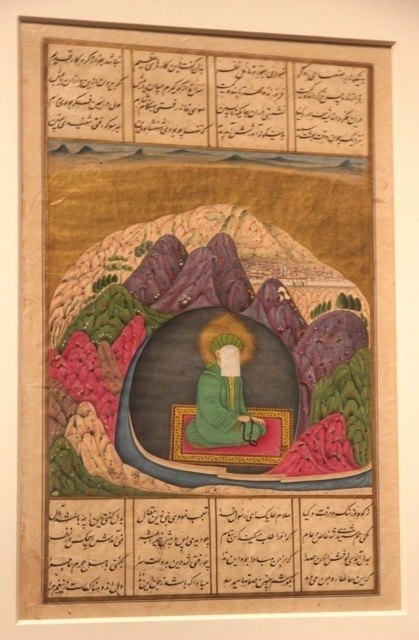 Another factor is the well-known Islamic proscription of images of The Prophet, nicely illustrated by a small Indian painting from 1720, “The Prophet Muhammad in the cave of Hira,” with the face—apparently sketched in by the artist—covered by a white veil, in keeping with tradition. Mirza notes that music, too, is sometimes forbidden. Abstraction may thus be said to be a part of religious tradition—as well as of contemporary secularism—a point that Mirza’s mixed-media painting, “Score for The Night Journey,” an inkjet print on handmade Wasli paper, with natural stone pigments and copper tape, made from the digitized score, not the museum’s Indian painting, makes. Mirza, describing his interest in digital culture’s ubiquity, as well as the use of pixelation and Photoshopping for veiling or distorting the facts: “By pixelating the image, I am drawing up questions around censorship.” Mirza has not modernized a religious painting; he has created an audiovisual examination—not amenable, perhaps, to impatient unbelievers—of how aesthetic and spiritual transport—art and religion—function within the taboos and other constraints of the wider culture. DeWitt Cheng is a freelance art critic and curator covering the San Francisco Bay Area. He has written for both print and online publications, including Artweek, ArtLtd, Artillery, Art21.com, East Bay Express, East Bay Monthly, HuffingtonPost.com, SanFranciscoArtMagazine.com, Sculpture, ShotgunReview.com, and VisualArtSource.com. He has written essays and articles for artists, galleries and museums, as well. From 2013 to 2016 he curated the Stanford Art Spaces exhibition program, serving science and engineering buildings on campus.